Abuja, Nigeria. May 21st, 2013 - Latest weekly poll results released by NOI Polls have revealed that almost 8 in 10 Nigerians (79%) do not have access to health insurance. The poll further revealed that almost 5 in 10 Nigerians (45%) rely on Private Hospitals/ healthcare facilities for their healthcare needs, with Federal Government Hospitals (25%) coming a distant second. In addition, poor healthcare facilities and the lack of facilities in some instances were identified as the main factors responsible for the high rate of infant mortality experienced in the country. These are a few of the key findings from the Healthcare System poll conducted in the week of May 13th 2013. In May 2013, Save the Children - an International NGO in its World Mothers’ Day Report, stated that out of 176 countries, Nigeria is ranked 169th worst place for a child to be born. Its Country Director, Susan Grant, said the health of mothers determines how their babies would fare in life; adding that about 89,700 babies die the same day they are born in Nigeria. Some of the recommendations in the report include: strengthening the health system; increased commitments and funding toward the health of mothers and children; and the passage and implementation of the National Health Bill (NHB). The NHB was first presented in 2006 and made its way through various bureaucratic bottlenecks before it was passed by the House of Representatives and the Senate in May 2011. However, the bill didn’t receive presidential assent due to a number of issues surrounding its content and passage. It has been sent back to National Assembly to commence fresh legislative process by the current senate, and is regarded as urgent and critical by stakeholders in order to revive the ailing healthcare system in Nigeria. Against this background, NOI Polls conducted its latest poll on the healthcare system. It is expected that the results & findings from the poll will highlight the perceptions of Nigerians and stimulate commentary to proffer recommendations to strengthening the country’s healthcare system. Respondents to the poll were asked people five specific questions. The first question sought to establish the type of healthcare facility mainly used by Nigerians. Respondents were asked: What form of healthcare facility do you personally use? Results show that almost 5 in 10 respondents (45%) use Private Hospitals and Health Facilities; followed by 25% who use Federal Government Hospitals. Furthermore, 13% of the respondents stated that they use State Government hospitals, and 10% simply use Pharmacies/Drug stores. Other facilities used include Traditional Healthcare (3%), Local Government Hospitals/Health Centres (2%), and Faith Healing Centres (1%). When results are analysed in greater detail, some variations are highlighted. More Female respondents (51%) use Private Hospitals & Health facilities compared to Male (38%). Also, the South-West has the highest percentage of respondents that use Private Hospitals & Health Facilities (59%), followed by the South-East (55%). The North-West has the highest proportion of Nigerians that use Federal Government Hospitals (31%), closely followed by the North-East (29%). The North-East also has the largest proportion of people (17%) that simply visit Pharmacies/Drug stores when they fall ill. The Northern zones have the most people that use Traditional Healthcare, which is barely existent in the Southern geo-political zones. Respondents were subsequently asked: Do you have access to any form of health insurance? From the results, almost 8 in 10 respondents (79%) answered negatively to the question, indicating that they do not have access to any form of health insurance. On the other hand, 21% answered “Yes” to the question. Furthermore, when analyzed across geo-political zones, the South-East region (26%) has the slight majority of respondents that claim to have access to health insurance; followed by the South-South and North-East with 23% each. Also, female respondents (24%) appear to have a slight edge over male respondents (18%) when it comes to accessing health insurance. Respondents that said they had access to Health Insurance were further asked: If yes, what form of Health Insurance do you have? The overall majority (59%) stated that they have access to the National Health Insurance Scheme (NHIS). This is followed by 35% who say they have access to health insurance via a private Health Management Organisation (HMO) paid by their employer; and 6% who say they have access via a private HMO, but self-funded. The North-West has the highest proportion (83%) of respondents that benefit from NHIS, followed by the North-Central (81%). Also, the South-West has the highest percentage of people (51%) with access to health insurance through their employers; while the South-South (15%) and South-East (12%) have the highest proportion of respondents with private HMO arrangements, which are self-funded. Next, respondents were asked the following question: Do you believe that Nigeria is one of the worst places to be born because of the rate of infant mortality? The results show that the majority (53%) responded negatively, indicating they disagree that Nigeria is one of the worst places to be born. This is followed by 41% of respondents that answered “Yes” and 6% that were not sure and answered “Don’t Know” to the question. There were significant differences by gender with the majority of female respondents (60%) disagreeing that Nigeria is one of the worst places to be born, while the majority of male respondents (51%) agree with the statement. Also, the North-Central has the highest number of respondents that agree (53%), while the South-South has the highest number that disagree (63%). Subsequently, respondents that agreed with the previous question (41% of the total) were asked the following question: If yes, what is mostly responsible for the high level of infant mortality? The majority (38%) are of the opinion that “Poor healthcare facilities” is mostly responsible for the high level of infant mortality. This is followed by 19% that reckon it is caused by “Lack of healthcare facilities” and 17% who think it is caused by “No money to pay for treatment”. Other reasons are “Illiteracy on the part of mothers” (14%) and “Insufficient health workers” (12%). 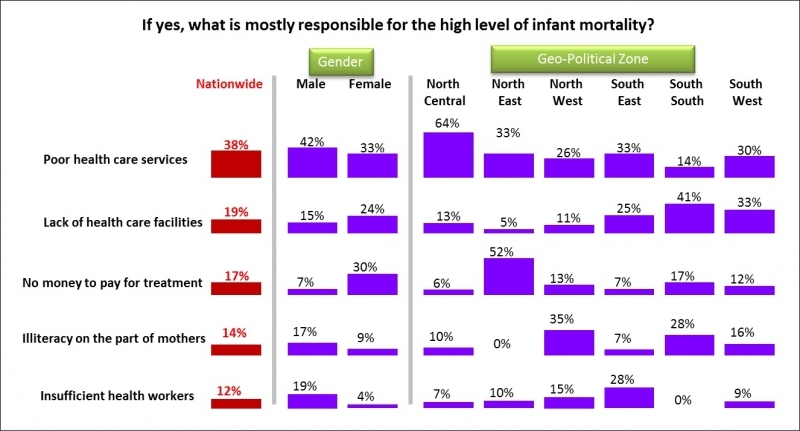 Looking across the geo-political zones, the North-Central has the highest proportion of respondents (64%) that think poor healthcare facilities are responsible for high infant mortality, while the North-East region has the highest (52%) that think it is because there is no money to pay for treatment. Finally, respondents were asked the following question: What recommendations do you have to lower infant mortality and ultimately improve the healthcare system in Nigeria? The majority of Nigerians (50%) are of the opinion that the Government should “Provide more healthcare facilities and modern equipment” in order to lower infant mortality and improve the healthcare system in Nigeria. This is followed by 24% who believe the government should “Train and employ more health workers”, 19% who think they should “Educate the public more” and 7% said Government should “Provide free healthcare services”. In conclusion, the results of this poll have clearly indicated that the majority of Nigerians use private hospitals and health care facilities for their healthcare needs, and do not have access to any form of health insurance. 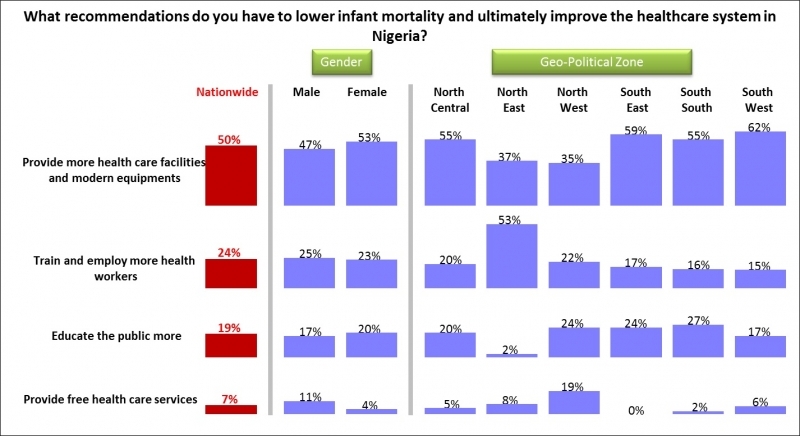 Also, it appears that most Nigerians do not agree with previous findings from International NGOs that Nigerian is one of the worst places to be born because of the high rate of infant mortality. While it is not clear why most Nigerians do not agree with the previous finding, perhaps this highlights perceived triviality on the issue of child mortality. 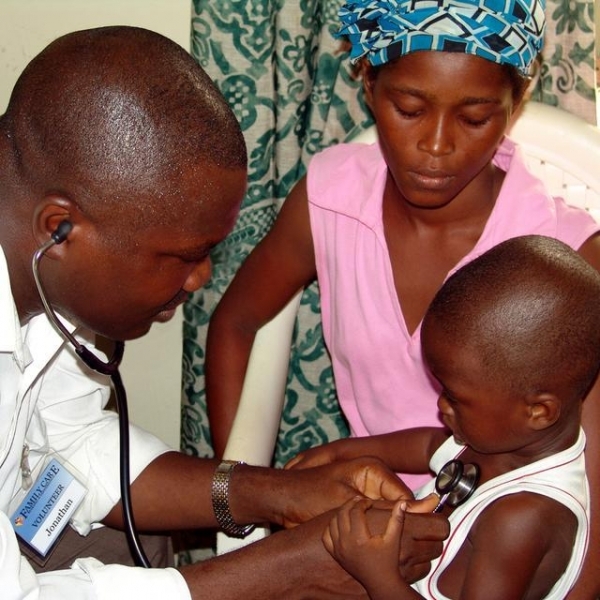 Finally, poor healthcare facilities or lack of healthcare facilities were identified as the main factors responsible for the high rate of infant mortality; with the provision of more health care facilities and modern equipment identified as the key recommendation to stemming the tide of infant mortality. This press release has been produced by NOI Polls Limited to provide information on all issues which form the subject matter of the document. Kindly note that while we are willing to share results from our polls with the general public, we only request that NOI Polls be acknowledged as author whenever our poll results are used, cited or published. NOI Polls hereby certifies that all the views expressed in this document accurately reflect its views of respondents surveyed for the poll, and background information is based on information from various sources that it believes are reliable; however, no representation is made that it is accurate or complete. Whilst reasonable care has been taken in preparing this document, no responsibility or liability is accepted for errors or fact or for any views expressed herein by NOI Polls for actions taken as a result of information provided in this report. Any ratings, forecasts, estimates, opinions or views herein constitute a judgment as at the date of this document. If the date of this document is not current, the views and content may not reflect NOI Polls’ current findings and/or thinking.